Ramadan: The Battle of Fasting for God or Eating Disorders? Your illness is not your identity. Your chemistry is not your character. It’s not a sin to be sick. Recovering from an eating disorder is never easy, but it can be particularly difficult in the month of Ramadan. There is a minority of the population that remains oblivious to the realities of mental illness. They fail to take into account how difficult Ramadan can be for people battling Eating Disorders. I’ve received many emails on negative thoughts and depression this year. Also many sufferers have complained of having low self-esteem, feeling worthless and very insecure. It’s difficult for many sufferers to accept how others are doing so well in Ramadan while they remain stuck in cycle of depression and ED. We covered the topic of Ramadan and Depression last year. 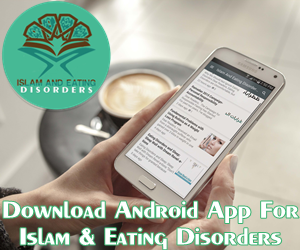 Eating Disorder, Depression and Anxiety don’t disappear in Ramadan. In fact, they can accompany you everywhere. Please keep in mind, your illness is not your fault. The recovery however is in our hands. I strongly encourage you to seek help for your illness. It is time to stop telling people with ED that their ED is their fault, and instead start working on how to best support one another. I hope you’ll find the article below useful on Tackling Ramadan with a Mental Health Condition. It was sent to me by a reader. Thank you. As Sofia partakes in fasting during Ramadan this year, her biggest challenge is far different from that of the majority of Muslims. “Most of my friends will be struggling with keeping their energy levels up, or making sure they pray on time. For most, there’s always a challenge to make sure you don’t over-eat. My challenge will be to make sure that I eat anything at all.”The 26-year-old Londoner is one of millions of Muslims around the world currently taking part in the Islamic holy month, in which Muslims are prohibited from eating or drinking during daylight hours. For Sofia, Ramadan is extra difficult. A few years ago, she was diagnosed with anorexia nervosa, after being hospitalised when she fainted in a college class.Though Sofia has been undergoing treatment with a therapist and learned to manage it, she says that Ramadan can often act as a trigger for the illness to creep back again. And because of the religious connotations of fasting during the holy month, she says that rather than restricting food intake being a problem, it can “sometimes be encouraged” and seen as a sign of devotion to God.“I’m a devout Muslim, and one of the five pillars of Islam (the obligations upon all Muslims) is Sawm (fasting). So every time Ramadan comes, I believe I have to fast. At the same time, I’m always in fear that it [the eating disorder]will come back. It feels like there’s always this conflict between my body and my soul.”Though Islamic scholars tend to urge Muslims who are fit and able-bodied to fast, the vast majority agree that fasting should not be obligatory to those who are pregnant, elderly or sick. And though this would normally mean that those suffering with mental illness are prohibited from fasting, both a lack of discussion within some Muslim communities, as well as a larger, societal stigma around mental health generally, means that many Muslims with such conditions may not be aware, or don’t consider themselves to be sick enough not to fast. It’s a sentiment shared by Dr. Mahmood Mahsid, a Washington-based clinical psychiatrist who has worked with patients from Muslim backgrounds. He told me that while there was “an increasing acknowledgement about mental health” in Muslim communities around the world, illnesses would often be left untreated “until the last minute”.